I have 2 bikes for sale. Ross Festina. Modified with a fixed longer boom for short cranks. Has original seat and handlebars and also a hard seat and hamster bars as extras. Seat clamps need shimming but otherwise OK. You will need to be minimum 6' to ride this unless you want to convert back to a sliding boom which would be possible but would require brazing etc. Tour Easy Easy Racer. Older model with Corbeau seat. Suit a rider up to about 6'. Very light and easy to ride. I have a windwrap screen for this but you would have to make your own brackets. Quite a few boxfulls - I need the space. You can have this for free but you have to take everything in one go - No cherry picking! Any pics of the bikes? I'll try and post some pictures of the bikes tomorrow. The seat that is wrapped belongs to the Festina. There are two mesh seats and one other hard fibreglass seat. 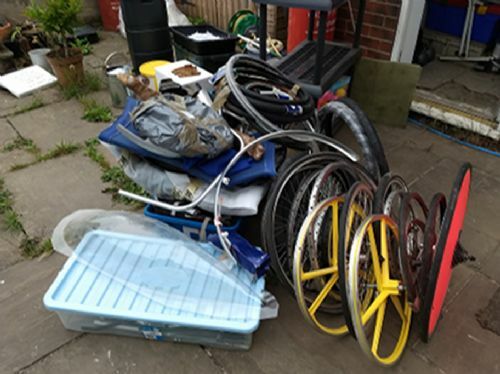 Various wheels and rims and tyres. Many are useful sizes for recumbents, there is a very nice 520 rear wheel for instance and some racing type 406 rims and tyres. Two of the the 20" wheels have Sach 3X7 hubs and there should be the changers and cables. 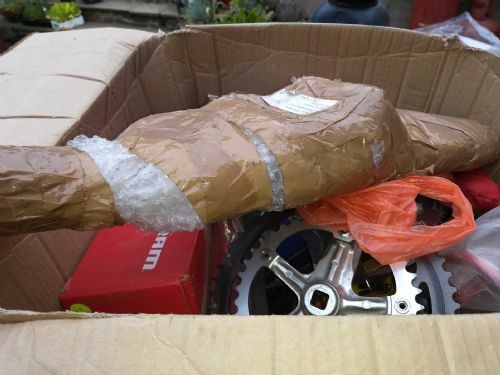 There should be an exceedingly rare Sachs Elite 12 speed hub and all parts in one of the boxes, also a 2 speed sachs hub. There are about 3 pairs of recumbent specific handlebars, also a moustache bar or two. There are a couple of pairs of suspension forks with the suspension in the headstock. Quite a few chainsets. There is a 60T chainwheel, pedals, cranks gears, changers etc., etc. There is another box or two not in shot. In short there is a lot of really useful stuff here for building bikes, both recumbent and upright. Some is new and some is recycled. It has to go otherwise I'd probably put it on eBay and get rid of it gradually, but it would be good to think someone is going to put at least some of this to good use. In terms of the Tour Easy I'm looking for about £250 and about £350 for the Festina. Open to sensible offers - cash only. Have you a picture of the tour easy? OK. PM me to arrange collection. I'll get pictures of the bikes today - weather permitting.